Extracted from The Path To Happiness. Before talking about how to deal with anxiety, let’s do a brief meditation that will help us release some of our stress and anxiety. When meditating, sit comfortably. You can cross your legs or sit with your feet flat on the floor. Place the right hand on the left, the thumbs touching so they make a triangle, in your lap against your body. Sit up straight, with your head level, then lower your eyes. Before we begin the actual meditation, we generate our motivation by thinking, "I will meditate in order to improve myself, and by doing so may I be able to benefit all the beings I come in contact with. In the long term, may I eliminate all defilements and enhance all my good qualities so that I can become a fully enlightened Buddha in order to benefit all beings most effectively." Even though enlightenment may seem a long way off, by generating the intention to transform our mind into one of an enlightened being, we gradually approach that goal. 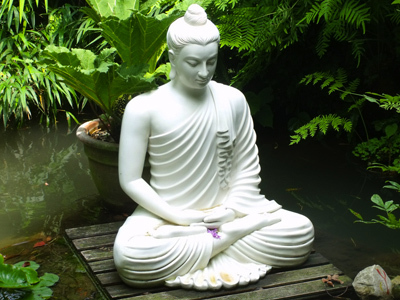 One meditation found in all the Buddhist traditions is the meditation on the breath. It helps to calm the mind, develop concentration, and brings our attention to the present moment. To focus on our breath and really experience what it feels like to breathe, we have to let go of the thoughts that chatter about the past and future and bring our attention simply to what is happening now. This is always more relaxing than the hopes and fears of the past and the future, which exist merely in our mind and are not happening in the present moment. When Buddha described the evolution of samsara—the cycle of constantly recurring problems in which we are presently trapped, he said that its origin was ignorance. This is a specific type of ignorance, one that misunderstands the nature of existence. Whereas things are dependent on other factors and are constantly in flux, ignorance apprehends them in a very concrete fashion. It makes everything seem super-concrete, as if all persons and objects had their own solid essence. We especially make ourselves very concrete, thinking, "Me. My problems. My life. My family. My job. Me, me, me." First we make our self very solid; then we cherish this self above all else. By observing how we live our lives, we see that we have incredible attachment and clinging to this self. We want to take care of ourselves. We want to be happy. We like this; we don’t like that. We want this and we don’t want that. Everybody else comes second. I come first. Of course, we’re too polite to say this, but when we observe how we live our lives, it is evident. It is easy to see how anxiety develops because of so much focus on "me." There are over five billion human beings on this planet, and zillions of other living beings throughout the universe, but we make a big deal out of just one of them—me. With such self-preoccupation, of course anxiety follows. Due to this self-centered attitude, we pay an incredible amount of attention to everything that has to do with me. In this way, even very small things that have to do with me become extraordinarily important, and we worry and get stressed about them. For example, if the neighbor’s child does not do their homework one night, we don’t get anxious about it. But if our child does not do their homework one night—it’s a big deal! If somebody else’s car gets dented we say, "Well, that’s too bad," and forget about it. But if our car gets dented, we talk about it and complain about it for a long time. If a colleague is criticized, it doesn’t bother us. But if we receive even a tiny bit of negative feedback, we become angry, hurt or depressed. Why is this? We can see that anxiety is very intricately related to self-centeredness. The bigger this idea that "I am the most important one in the universe and everything that happens to me is so crucial" is, the more anxious we are going to be. My own anxious mind is a very interesting phenomena. Last year, I did a retreat by myself for four weeks, so I had a nice long time to spend with my own anxious mind and know it very well. My guess is that it’s similar to yours. My anxious mind picks out something that happened in my life—it does not make a difference what it is. Then I spin it around in my mind, thinking, "Oh, what if this happens? What if that happens? Why did this person do this to me? How come this happened to me?" and on and on. My mind could spend hours philosophizing, psychologizing and worrying about this one thing. It seemed like nothing else in the world was important but my particular melodrama. When we are in the middle of worry and anxiety regarding something, that thing appears to us to be incredibly important. It’s as if our mind doesn’t have a choice—it has to think about this thing because it’s of monumental significance. But I noticed in my retreat that my mind would get anxious about something different every meditation session. Maybe it was just looking for variety! It’s too boring to just have one thing to be anxious about! While I was worrying about one thing, it seemed like it was the most important one in the whole world and the other ones weren’t as important. That is until the next session arrived, and another anxiety became the most important one and everything else was not so bad. I began to realize it isn’t the thing I am worrying about that is the difficulty. It is my own mind that is looking for something to worry about. It doesn’t really matter what the problem is. If I’m habituated with anxiety, I’ll find a problem to worry about. If I can’t find one, then I’ll invent one or cause one. In other words, the real issue is not what is happening outside, but what is happening inside of us. How we experience a situation depends on how we view it—how we interpret what is happening, how we describe the situation to ourselves. Thus the Buddha said that all of our experiences of happiness and suffering don’t come from other people or other things, but from our own minds. How do we deal with our minds when we become very self-centered and anxious? It is important to learn to laugh at ourselves. We really do have a monkey mind when it comes to anxiety, don’t we? We worry about this and then we worry about that, like a monkey jumping all over the place. We have to be able to laugh at the monkey instead of taking it so seriously and to develop a sense of humor about our problems. Sometimes our problems are pretty funny, aren’t they? If we could step back and look at our problems, many of them would seem quite humorous. If a character in a soap opera had this problem or was acting this way, we would laugh at it. Sometimes I do that: I step back and look at myself, "Oh, look how Chodron feels so sorry for herself. Sniff, sniff. There’s so many sentient beings having so many different experiences in the universe, and poor Chodron just stubbed her toe." Thus one antidote is to have a sense of humor and be able to laugh at ourselves. But for those of you who can’t laugh at yourselves, there is another way. The great Indian sage Shantideva advised us, "If you have a problem and you can do something about it, there is no need to get anxious about it because you can actively do something to solve it. On the other hand, if there is nothing you can do to solve it, getting anxious about it is useless—it won’t fix the problem. So either way you look at it, whether the problem is solvable or unsolvable, there is no sense in getting anxious or upset about it. Try thinking like that about one of your problems. Just sit for a minute and think, "Is there something I can do about this or not?" If something can be done, go ahead and do that—there’s no need to sit around and worry. If nothing can be done to alter the situation, it is useless to worry. Just let it go. Try thinking like that about a problem that you have and see if it helps. Sometimes we are anxious and nervous before going into a new situation. Afraid that we will make fools out of ourselves, we think, "I may do something wrong, I’ll look like a jerk, and everybody will laugh at me or think badly of me." In these cases, I find it helpful to say to myself: "Well, if I can avoid looking like an idiot, I’ll do that. But if something happens and I look like an idiot then okay, so be it." We can never predict what other people will think or what they will say behind our back. Maybe it will be good, maybe not. At some point we have to let go and say to ourselves, "Well, that’s okay." Now I’ve also started thinking, "If I do something stupid and people think poorly of me, that’s okay. I do have faults and make mistakes, so it’s no wonder if others notice them. But if I can acknowledge my mistakes and rectify them as much as possible, then I have fulfilled my responsibility and surely others don’t hold my mistake against me." Another way of dealing with anxiety is to lessen our self-centeredness and train our mind to pay more attention to others than to ourselves. This doesn’t mean that we ignore ourselves. We need to pay attention to ourselves, but in a healthy way, not in a neurotic, anxious way. Of course we need to take care of our body and we should try to keep our mind happy. We can do this in a healthy and relaxed way by being mindful of what we are thinking, saying and doing. This kind of focus on ourselves is necessary and is part of Buddhist practice. However, it is very different from the self-centeredness that makes us so distressed and restless. That self-centeredness puts undue emphasis on ourselves and thus makes every small thing into a big one. By considering the disadvantages of self-preoccupation, we will find it easier to let go of that attitude. When it arises in our mind, we will notice it and think, "If I follow this self-centered attitude, it will cause me problems. Therefore, I won’t follow that way of thinking and will turn my attention instead to view the situation from a broader perspective, one that encompasses the wishes and needs of everyone involved." Then we can use the same amount of energy to be sensitive to others and develop a kind heart towards them. When we look at others with an open mind, we recognize that everybody wants to be happy and free of suffering as intensely as we do. When opening our hearts to this fact, there will be no space left inside ourselves for self-centered anxiety. Look in your own life, when your heart has been filled with genuine kindness toward others, have you simultaneously been depressed and anxious? It’s impossible. Some people may think, "But I do care about others, and that’s what makes me anxious," or "Because I care so much about my kids and my parents, I worry about them all the time." This kind of caring isn’t the open-hearted loving-kindness that we are trying to develop in Buddhist practice. This kind of caring is limited to only a few people. Who are the people that we care about so much? All the ones who are related to "me"—my kids, my parents, my friends, my family. We are right back to "me, me, me" again, aren’t we? This kind of caring about others isn’t what we are trying to develop here. Instead, we want to learn to care for others impartially, without thinking some beings are more important and others are less worthy. The more we can develop equanimity and an open, caring heart towards all, the more we’ll feel close to everyone else and the more we will be able to reach out to them. We have to train our mind in this broad attitude, expanding our care from the small group of people around us so that it gradually is extended to everyone—those we know and those we don’t, and especially to those we don’t like. To do this, start by thinking, "Everyone wants to be happy, just like me, and nobody wants to suffer, just like me." If we focus on that thought alone, there is no space left for anxiety in our minds anymore. When we look at each living being with this recognition and immerse our minds in that thought, our mind will automatically become very open and caring. Try doing this today. Whenever you are looking at people—for example, when you are in a shop, on the street, in a bus—think, "This is a living being that has feelings, someone who wants to be happy and doesn’t want to suffer. This person is just like me." You will find that you will no longer feel that they are complete strangers. You will feel like you know them in some way and will respect each of them. Then, if we think about the kindness of others, our mood and the way we see others totally transform. Usually we do not think about others’ kindness to us, but our kindness to them. Instead, we focus on the thought, "I care for them and helped them so much, and they don’t appreciate it." This makes us very anxious and we start to worry, "Oh, I did something nice for that person, but they don’t like me," or "I helped that person, but they don’t recognize how much I helped them," or "Nobody appreciates me. How come nobody loves me?" In this way, our monkey mind has taken over the show. We focus so single-pointedly on how kind we have been to others and how little they appreciate us that even when somebody says to us, "Can I help you?" we think, "What do you want from me?" Our self-preoccupation has made us suspicious and unable to see or accept the kindness and love that others genuinely give us. By meditating on the kindness of others, we will see that we have actually been the recipients of an incredible amount of kindness and love from others. In doing this meditation, first think about the kindness of your friends and relatives, all the different things that they have done for you or given you. Start with the people who took care of you when you were an infant. When you see parents taking care of their kids, think, "Somebody took care of me that way," and "Somebody gave me loving attention and took care of me like that." If nobody had given us that kind of attention and care, we wouldn’t be alive today. No matter what kind of family we came from, someone did take care of us. The fact that we are alive attests to that, because as children we could not take care of ourselves. Think about the incredible kindness we received from those who taught us to speak. I visited a friend and her two-year-old child who was learning to speak. I sat there, watching as my friend repeated things over and over again just so her child could learn to speak. To think that other people did that for us! We take our ability to speak for granted, but when we think about it, we see that other people spent a lot of time teaching us how to speak, make sentences, and pronounce words. That is a tremendous amount of kindness we have received from others, isn’t it? Where would we be if no one taught us how to talk? We did not learn by ourselves. Other people taught us. Everything we learned throughout childhood and everything we keep learning as adults—every new thing that comes into our lives and enriches us—we receive due to the kindness of others. All of our knowledge and each of our talents exist because others taught us and helped us to develop them. Then consider the tremendous kindness we received from strangers, people that we do not know. So many beings whom we don’t know personally have done things that have helped us. For example, we received an education due to the kindness of people who dedicated their lives to building schools and establishing educational programs. We ride on roads that exist due to the effort of so many engineers and construction workers whom we have never met. We probably do not know the people who built our home, the architects, engineers, construction crew, plumbers, electricians, painters, and so forth. They may have built our home in the summer, enduring the hot weather. We don’t know these people, but because of their kindness and effort, we have homes to live in and a temple where we can come and meet together. We don’t even know who these people are to say, "Thank you." We just come in, use the buildings, and receive benefit from their effort. Seldom do we consider what they had to go through so that we could live so comfortably. Next we reflect on the benefit from those who have harmed us. Although it may seem that they harmed us, but if we look at it in another way, we have received benefit from them. For example, a few years ago someone did something quite mean to me behind my back. At the time, I was very upset and thought, "Oh, this is awful. How could this person do this to me?" Now I realize that I’m glad this situation happened because it opened up a new direction in my life. If this person had not been so unkind to me, I would still be doing what I had done before and would probably be stuck in a rut. But this person’s actions pushed me to be more creative. Although initially the situation was very painful, in the long-term, it had a very good effect on my life. It forced me to grow and to develop other talents. So, even the people or situations that we feel are bad can turn out to be good in the long run. It is interesting to look at some of our present problems from that perspective. Instead of getting anxious about our present problems, think, "Maybe in a few years, when my perspective is broader, I will be able to look back on the people causing this problem and see that it was really a beneficial situation. I will be able to see it as something that propelled me in a new direction." Try to think about your present problems in this way. If we do that, the present anxiety stops, and slowly, our heart will be filled with appreciation for the kindness of others. Meditating on the kindness of others is quite important. So sit and do it slowly. Think of all the individuals from whom you have received benefit, even those you do not know, like the people who built your cars, make the books you read, and collect your garbage. Do you know the garbage collectors in your neighborhood? I don’t know the ones in my neighborhood. I don’t see them. But they are incredibly kind. If they did not take away my garbage every week, I would have a big problem! So many people serve us in countless ways. If we can open our heart and see how much we have received from them, our attitude completely changes. We become very grateful, content, and joyful. When we are in the middle of a problem, we feel like nobody is helping us. We feel all alone with our problem. But when we do this meditation, we can see that in fact, a lot of people are helping us. More people could even help us if we would open ourselves up to receive from them. If we think like this, our anxiety goes away. We do not feel stuck and alone in our problem because we see that there is actually quite a bit of help and assistance out there. After we meditate on the kindness of others, it is easy to feel love and compassion towards them. Love is the wish for sentient beings to have happiness and its causes. Compassion is the wish for them to be free from suffering and its causes. When great love and great compassion are alive in our hearts, we will want to take responsibility to benefit all others and will have a great resolve to do so. From this comes bodhicitta, the altruistic intention to become a Buddha in order to benefit others most effectively. When we have this altruistic intention to become a Buddha, we become a bodhisattva. When we are a bodhisattva, it is guaranteed that we will have no anxiety. Look at Kuan Yin. She looks at all sentient beings and wants them to be happy. She does whatever she is capable of doing to take care of all of us, but she does not get nervous, upset, worried or stressed out. She is able to do what needs to be done to help others and lets the rest go. We never hear of Kuan Yin getting depressed or having anxiety attacks. She is able to handle everything that happens. We can also become that way. We can look to Kuan Yin for inspiration while we practice the Dharma. She is the embodiment of and represents great love and great compassion towards all living beings. Kuan Yin was once an ordinary being like us, with all of the same confusion and anxiety. Through practicing the path with great effort, she developed such wonderful qualities and became a bodhisattva. If we study the Dharma and practice in the same way, we too can develop qualities just like hers.